You can take the girl out of New York City, but you can’t take New York City out of the girl. This is why I was especially excited for the opportunity to review Twinko, a company with wonderful organic products that takes pride in being New Yorkers and in the fact that all of their products are locally made! Featuring handmade items with original graphics, such as their flagship character Toby the owl, Twinko will delight parents and little ones alike! Twinko’s line includes adorable onesies and tees made of 100% certified organic cotton and printed with eco-friendly ink. The onesies are available in size 6-12 months and the tees range in size from 12 months to 4T. With so many styles to choose from, you may need several! 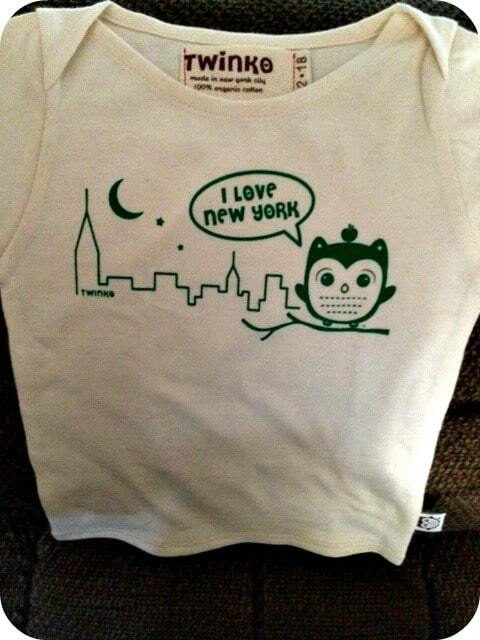 In honor of my hometown, I chose the “I Love New York” tee featuring Toby the owl hovering over the NYC skyline. I especially love the added touch of the apple resting on his head. The fabric is soft and it washed beautifully (I recommend a low setting or line drying to avoid the inconvenience of shrinking the fabric). The tees feature overlap at the shoulders to make it easy to pull over your baby’s head. These tees make a great layering piece for fall and worked well over a thin, long sleeve onesie. The cut is on the narrow side (which worked for my little man) but consider going one size up for maximum wear. All tees arrive in an adorable brown box, so these are ready to gift as soon as you receive them! Twinko also sells bibs with a variety of adorable graphics. The bibs tie behind the neck, which is great if you have a Houdini who has mastered both snap and Velcro style bibs (at the very least a knot might slow him down a little bit). 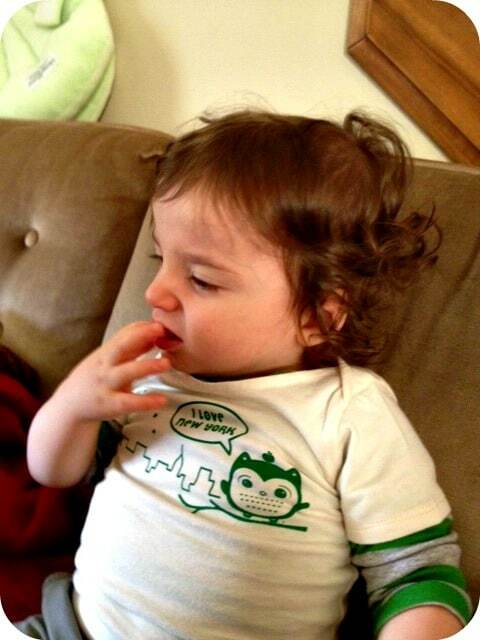 The bib I chose features Toby with his silverware in both hands and the phrase “Hungry Day”. There are so many options to fit any mood or style! The bibs arrive in a small cloth bag that is also ideal for gifting. 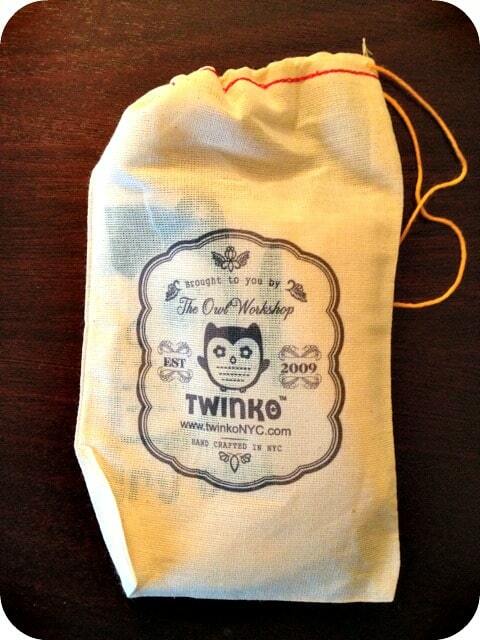 For the big kids in your life (or yourself), Twinko has a collection of totes as well! Made of recycled canvas, the totes are 16″wide x 15.5″ tall x 5″ flat bottom with 22″ handles. I just had to have the “I love NY” tote which will be a great edition to my “bags I can’t live without” collection. The totes are also machine washable (dry flat on the rack). In addition to the totes, tees, and bibs, you can purchase pillows, activity kits, holiday items, and special gift collections that also feature the adorable graphics of Twinko! Many unique gift options will make shopping for the upcoming holidays a snap. Visit their site today to view their complete line of fun, environmentally friendly products! Use this promo code to receive 10% off your order: twinkolittlestar. I like the Heart Breaker onesie. I love the Hungry Day Onesie/ Tee! I like the Future CEO onesie/ Tee! Thanks! I like the Twinkoland Coloring book Set. Love the Ghost and Pumpkin onesies! I love the Future Chef Onesie/Tee! Future Chef Onesie would be great for my baby!